Dacha co-founders Dmitri Chekaldin (left) and Ilya Alter will open a second location of their popular beer garden in Navy Yard. Photograph courtesy of Dacha. The area around Navy Yard/Nationals Park is becoming a beer-lovers destination—there’s Bardo Brewing, Bluejacket, and the forthcoming Atlas brewery and tap room next year. But first: Dacha Navy Yard. The popular Shaw bar is slated to debut an 800-person beer garden this spring—plus an indoor/outdoor bar and modern American restaurant—tucked between Nationals Park and the Anacostia River. What began as a brainstorming session between two friends in 2013 has become a growing beer garden empire for owners Dmitri Chekaldin and Ilya Alter. The Russian expats, who met while at George Washington University and the University of Maryland, respectively, traded careers in corporate finance for something seemingly less glamorous: a beer truck and a few porta-potties in the parking lot of a Chinese takeout on Seventh Street, Northwest. The theme of their beer garden was largely German and Belgian, though they looked towards home for the name and vibe. “Dacha in Russian is a summer country house. You go with your parents to dacha on Saturday and Sunday—it didn’t matter if you owned a company or were a bookkeeper, it was a way to get away from city life,” Alter says. Eventually they outfitted the space with greenery, coverings, and heaters to keep it going year-round. In the meantime, developer MRP was eager for Dacha to join the mixed-use development Dock 79 (also home to the Salt Line and All-Purpose). Similar to the first Dacha, the new location will play on themes of a country escape. The sprawling beer garden, located just outside the rear entrance of Nationals Park, has river views and will be filled with red maple and linden trees. The bar will pour 26 German, Belgian, and American beers, ciders, and meads on draft, and will open with a simple biergarten-inspired menu of dishes like pretzels and sausages. The food and drink in the 150-seat dining room—slated to open first—will go beyond snackable outdoor fare. 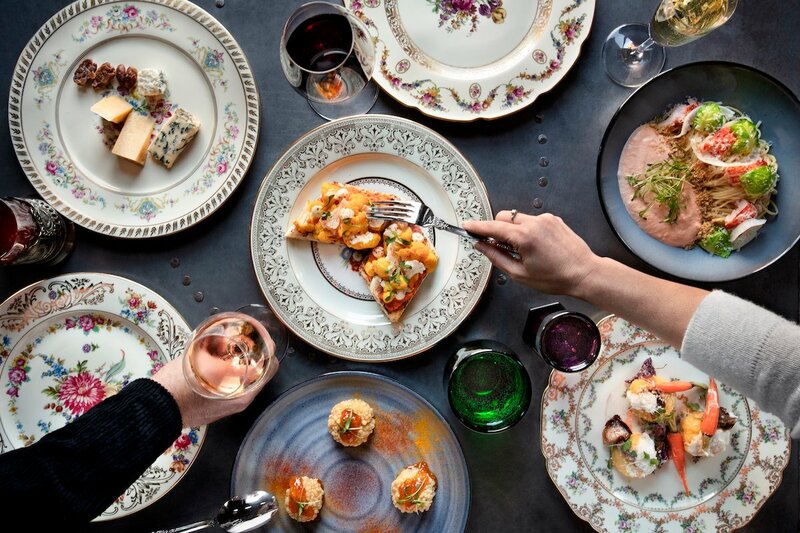 Chef Taylor Burlingame, an alum of Michael Mina’s RN74 in San Francisco and former Requin executive chef, is at the helm. The menu is still in the works, but the team describes it as “modern American comfort fare”—anything from lobster pasta to prime rib and cassoulet. An adjoining 50-seat bar/lounge boasts another 24 taps for beers and cider, plus house wines and draft cocktails. Huge windows will open to the the beer garden in nice weather for an indoor/outdoor feel. 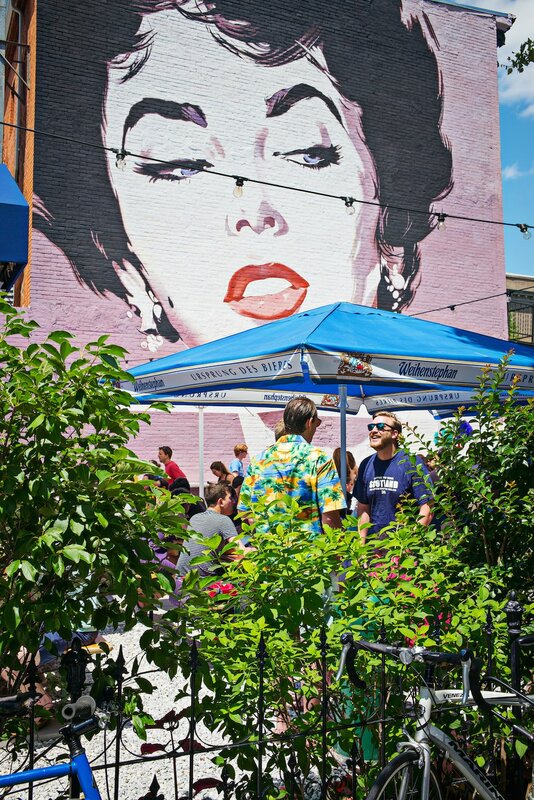 Elizabeth Taylor looks over Dacha beer garden in Shaw. Photograph by Scott Suchman. Chekaldin and Alter are in the process of designing the space, which takes cues from mid-century modern design, and also plays on themes from the 1960s-era Soviet Union and US. Just as a giant Elizabeth Taylor mural has been the focal point of Dacha Shaw, the team tapped Russian dissident artist Igor Ponochevnyi and local muralist Byron Peck to render another two American icons for Navy Yard. Indoors, a huge JFK mural will look over the dining room with nods to Soviet-era themes like the Berlin Wall. Outdoors, a 16-foot Jackie gazes out towards the boardwalk. “We wanted another iconic, admired, beautiful woman, that when you look at that image you know where it is,” says Alter. An exact opening date is TBD, but the team has their fingers crossed for late March.